The small things that piss you off,that shouldn't. The small things that **** you off,that shouldn't. In this post you can vent your spleen about the things that don't really matter in the scheme of things. Things people do that don't really matter, but just annoy you. Either by words or pictures,your choice. But it has to be something that really doe's get under your skin. The mate who takes the second to last beer from the 6 pack,and puts the last one back in the fridge in its packaging. "put the pack in the bin and put the single beer back in the fridge Ross". 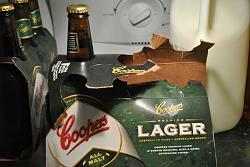 He's been doing it since we started buying beer in 1983, I think he just does it now to **** me off. You've found yourself behind them. Posted speed limit is, for example, 65mph and these people are doing a solid 60mph, and there is no place to get around them until the Passing Lane 5 miles ahead. So you wait patiently for your chance. Ah, Passing Lane at last! Then, as you pull out to go around, they speed up and continue increasing speed to KEEP YOU FROM GOING AROUND!! So, you think, OK, if you're going to drive a reasonable speed, I'll keep my position back here, because I don't have to be in the front of the line. Passing Lane ends, AND THEY SLOW DOWN AGAIN TO 5MPH UNDER THE LIMIT!! WORSE, THEY'RE GOING TO PASS A BIG RIG DOING 55mph, AND THEIR CRUISE CONTROL IS SET ON 62mph, AND THEY TAKE THE WHOLE ENTIRE PASSING LANE AND NO ONE ELSE GETS AROUND! That feels a Lot better! Thank you, Clarke, for the opportunity to vent. Last edited by Cadillac; 04-30-2014 at 01:00 PM. Kids who scream in Supermarkets ..& dim wit parents who let their kids scream in Supermarkets !!! [QUOTE=LnrB;965375]You've found yourself behind them. Posted speed limit is, for example, 65mph and these people are doing a solid 60mph, and there is no place to get around them until the Passing Lane 5 miles ahead. So you wait patiently for your chance. I drive to various customers around the state and encounter this ALL THE TIME. I especially like when someone is "passing" you in the passing lane only to slow down as they approach your back bumper and keep pace with you. Or they speed up as you try to pass. 1. People driving under the speed limit in the fast lane and when you decide to go around them (note: I don't tailgate them) they speed up so you can't pass. 2. People who cut you off in the "safe gap" you leave between you and the car in front of you. 3. People who drive at the same speed in all lanes and you can't pass them. 4. People who use cell phones whilst driving. 5. Reckless drivers on the highway at night. 6. BMW and Mercedes drivers because they are usually guilty of the items listed above. 7. Motorcyclist who think they own the roads and do dangerous maneuvers. 8. People who don't clean after themselves. 9. Being a passenger with a bad driver. 10. Driving in LA traffic. Nothing pisses me off, everything and everybody is wonderful. Crap, I've run out of gin. People who ignore merge signs and drive on the shoulder, trying to cut in traffic instead of following the rest of the line of cars. I refuse to let these people in. Stupid people in general get on my nerves. I just want a simple rule/law to be put in place that would make stupidity painful. I bet we could raise the average IQ of the world by 30 points easy by doing this. Granted, I am sure I would be on the recieving end of a few painful "lessons". But then, this will normally happen when I am demonstrating to others just how stupid they are being. But then there are other times when I just sit back and ponder, "It must be great to be blissfully unaware of how stupid you are". Americans who use the word "whilst". "I refuse to let these people in." ME TOO!! In fact, as they move up the line looking for some softie I'm saying, "DON'T LET HIM IN! DON'T LET HIM IN!" But there's always some do-gooder out front somewhere who buckles. It only encourages those people to continue to be Rude! Not being particularly sexist but women on roundabouts; don't stop if there is nothing coming! Look ahead, be aware, keep the traffic moving! Remember, you are not in a traffic jam, you are the traffic jam. Subaru drivers. The kids in a WRX with a fartcan driving like an A$$hat or the rest of the owners driving like a blind person doing 10 below the limit or driving like the mobile traffic jam on a 2 lane. Always seems to be a Subaru. People who have to stand in the middle of the supermarket isle to read the labels 'cause they need reading glasses. Parents that let kids play in the supermarket. Supermarket employees who wheel out a large trolly of stuff for the shelves and then leave it there blocking the isles. People who just as they get out of the door at the supermarket stop dead. Other people who shop in the supermarket when I want to . I sense a supermarket based theme here; have you tried using your local independent shops instead? Much nicer, especially if you like looking at houses for sale, gambling or hunting through stuff that other people have given away. Not really a theme , it's just that I had just got back from the supermarket !! I'll let you know when I go somewhere else .....I am sure something will pee me off ! What the heck is a "finutiae"? Quick Reply: The small things that piss you off,that shouldn't.